NADON J. (Reasons for Order):— The applicants seek to set aside a decision of the Refugee Division of the Immigration and Refugee Board (the “Board”) dated July 19, 1999 which determined that the applicants, who are husband and wife from Sri Lanka, were not Convention refugees. The applicants arrived in Canada on July 20, 1996 and applied for refugee status on the basis of political opinion, race, nationality and social group; they are Tamils from the North of Sri Lanka. Mr. Velautham KANAGARATNAM, 65 years old, and his wife, Thanapakiyam KANAGARATNAM, 62 years old, are both citizens of Sri Lanka. They allege a well-founded fear of persecution because of their political opinion, race and nationality, being Tamils, and membership in a particular social group, namely Tamils from the North of Sri Lanka. 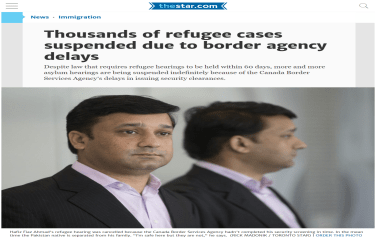 The claimants arrived in Canada on July 20, 1996, and claimed refugee status. On May 29, 1997, the Convention Determination Division (CRDD) determined that on a balance of probabilities, the claimants do not have good grounds for fearing persecution. On May 14, 1998, the claimants left for the United States. They remained there until April 24, 1998 when they returned to Canada and applied again for refugee status. The panel considered the Chairperson’s Guidelines on Refugee Claimants Related to Civilian Non-Combatants Fearing Persecution in Civil War Situations. In order to succeed, this repeated claim needed new evidence to be considered by this panel, namely any change of circumstances. Counsel submitted two exhibits, which are two press releases.These exhibits indicate that older people are at times arrested by Sri Lankan authorities. However, this evidence is not new in itself; in this panel’s specialized knowledge, such events also occurred previously. Counsel also submitted three decisions of the Federal Court and he argued that if these decisions were available to the previous panel, they would have led this panel to determine the case positively.However, the panel considered that the three Federal Court decisions presented by Counsel are related to different situations which have no direct bearing on this case. Whether or not res judicata would be applicable to this claim, we see no reason in the additional submissions, facts, evidence, or PIF presented by Counsel to find the claimants would have a reasonable chance of being persecuted for a Convention reason if they were to return to Sri Lanka. In conclusion, the panel rules that Mr. Velautham KANAGARATNAM and his wife , Thanapakiyam KANAGARATNAM, are not “Convention refugees” as defined in sub-section 2(1) of the Immigration Act. In my view, the decision cannot stand. Firstly, the decision does not provide, in my view, clear and cogent reasons why the refugee claim is denied. On my reading of the Board’s decision, I am not certain that it decided the res judicata issue. Maybe the Board felt that it had but, on my reading of the reasons, I am in doubt. Secondly, with respect to the merits of the refugee claim, the Board has provided no reasons whatsoever, apart from a bald statement that there is no reasonable chance of persecution if the applicants return to Sri Lanka. In the present instance, when the Board concludes that the claimants are not at risk of being persecuted should they return to Sri Lanka, does it have in mind the IFA finding made by the previous panel or is the Board arriving at a general conclusion with regard to the overall merits of the applicants’ claim? Again, I am left in doubt on this issue. The reasons given by the Board, are not, in my view, satisfactory. I am a heart patient. Doctors have told me I should be going in for a surgical operation very soon. My physical and mental health had been deteriorating since my wife and I were arrested by the CID branch of the Sri Lankan police in July 1996. We are both feeling extremely depressed since our arrival in Canada. My wife would cry on an almost daily basis. She also ha a recurrent nightmare of the harassment at the CID branch in Colombo. Her three brothers live in Sri Lanka. Her last contact with her brothers was in October, 1995. She has no knowledge of her daughter’s current whereabouts either. She is very worried about her brothers’ well-being and is afraid that they may no longer be alive. Her concentration is very poor and she has occasional thoughts of suicide. I am sixty four years of age. My memory is very poor. I do not have any close relatives or friends in any part of Sri Lanka who could provide assistance and/or accommodation to my wife and myself. My mental and physical health is not conducive to seeking internal flight alternative in Colombo or other town outside of Northern Sri Lanka. My wife and I experienced harassment by the Colombo police while we were in Colombo just before our departure from there. Counsel for the applicants argued that his clients’ health was a relevant factor in regard to an IFA determination. The Board does not appear to have considered this evidence. Whether or not these facts are “new” and thus sufficient to allow the Board to examine the merits of the matter, I need not address. That is a matter which the new panel will have to consider. I am satisfied, however, that the Board ought to have examined this evidence and made a determination in respect thereof. I wish to note that at the hearing no one asked any questions to the applicants regarding their new evidence and in particular regarding the health of the male applicant. No one includes counsel for the applicants and the panel members. Hence, I cannot determine whether the male applicant had a heart condition at the time or prior to the first hearing in February 1997. This is another case where no one appears to have been interested in posing relevant questions regarding the issues raised by the refugee claim. One final note. Â Counsel for the applicants raised as an issue his clients’ former counsel’s omission “to introduce psychological assessments of both applicants at the second hearing”. Counsel is here referring to two reports by psychologist Maria Haladyn-Dudek dated July 12, 1999. These reports appear to have been sent by letter dated July 16, 1999, to Mr. Joseph W. Allen, allegedly an associate of Mr. Martin Forget who represented the applicants at their July 19, 1999 hearing. I indicated to Mr. Berger, counsel for the applicants, that there was no evidence before me that Mr. Forget had received and thus had in hand the two reports when he appeared at the July 19, 1999 hearing. According to counsel appearing before me, former counsel at the credible basis hearing misstated the applicant’s position. However, I cannot determine from the material before me that the basis for former counsel’s argument was not rooted in information provided to counsel by the applicant himself or that former counsel’s argument was not, although unsuccessful, a determined strategy before the credible basis tribunal. It may also be that counsel had little or no familiarity with the refugee process. However, this is not equivalent to incompetency. While it would be desirable that all litigants be represented by counsel who are both knowledgeable and experienced, I am not aware of any jurisprudence to the effect that if a tribunal or court proceeds with one or both parties represented by inexperienced counsel, that this constitutes an error of law. Finally, it was submitted that counsel did not advise the applicant of his right to seek judicial review. Even if this is true, I cannot see how it assists the applicant. The failure of counsel to advise a client of all avenues of appeal can have no effect on the decision being appealed from. The applicant may have other relief against counsel who represented him at the credible basis hearing. But on the question of representation by counsel, I cannot find that the credible basis tribunal committed an error of law in this case. It seems to me that in many cases unsuccessful litigants may wish to blame the result on the inadequacy of counsel. Where there is merit to such a claim, a client may be able to proceed to against counsel and secure recovery. However, in my opinion, the failure of counsel, freely chosen by a client, cannot, in any but the most extraordinary case, result in an overturning of a decision on appeal or judicial review. I agree entirely with Mr. Justice Rothstein’s comments in Huynh. It goes without saying that each case must be determined upon its own facts. However, I am of the view that an applicant must adduce clear and convincing evidence that previous counsel was indeed negligent and that, that negligence was material. In the present matter, the applicants did not inform Mr. Forget of the position that they intended to take in this judicial review application. Consequently, I do not have the benefit of Mr. Forget’s evidence so as to decide whether he was negligent and whether that negligence was material so as to justify an intervention by this Court. Again, on the assumption that Mr. Forget had the reports in hand and did not produce them, he may well have had a reasonable explanation as to why he did not do so. In my view, it is almost imperative that previous counsel be given notice by an applicant who intends to raise negligence of former counsel as an issue. Thus, previous counsel might wish to sign an affidavit in order to provide to the Court the other side of the coin, if any. Whether previous counsel should be approached by an applicant or by the Minister I need not decide. However, it is important to remember that only the applicant, the former client, can waive the solicitor-client privilege. For these reasons, this application for judicial review shall be allowed. The Board’s decision dated July 19, 1999 will be set aside and the matter will be returned to the Refugee Division for redetermination by a differently constituted panel.